The kinds of jobs that pop into your mind when someone says the words “tech startup” are probably “engineer”, “coder”, and maybe even “coffee drinker” (yes, that is definitely a real job). But many people forget that tech startups are still companies, and therefore need teams that never even type a single line of code, such as marketing teams, management teams, and sales teams. I mean, why build software if you can’t sell it to anyone? Here at Salsify, a leading tech startup in Boston, we have a highly successful sales team that works relentlessly everyday to sell our unique platform. But our little startup has been rapidly expanding, and is not so little anymore. And we need a larger sales team to reflect that. A Business Development Representative (BDR) is the first face that a potential customer will see. They work with closing reps, sales managers and marketing teams to identify and generate sales opportunities through cold calling, emailing, and other marketing campaigns. 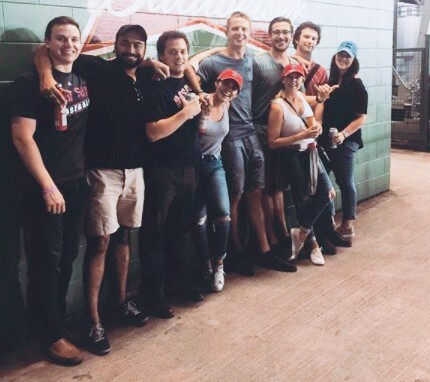 Being a Business Development Representative at Salsify has many perks, and no, they’re not all food related (although our fully stocked kitchen and weekly free lunches would beg to differ). Below, I’ve listed out many of the fantastic aspects of being a Business Development Representative. 1. Get trained with an amazing program. Many companies will just throw you into the deep end, tossing you a thick, wordy binder as a life preserver. Not at Salsify. We have developed a one-of-a-kind sales training program to ensure that all of our BDRs are prepared to tackle any possible sales situation. The BDR training program teaches our newest BDRs everything from company values, to impact messaging, to client use cases. In addition to the classroom setting, the program incorporates role playing, calling hours, and one-on-one coaching sessions. The point of these training sessions is to inform new BDRs about our sales process and how to handle our hundreds of clients. We want our BDRs to be as comfortable and confident as possible, and we’ve found that this type of program helps new employees feel right at home from the very start. 2. Learn about your career options. Becoming a Business Development Representative doesn’t limit you to that one role. Here at Salsify, we have special programs created to help BDRs explore all their options here. BDR Manager Mike Shoer recently launched “open house” meetings for his team. BDRs get the opportunity to speak with hiring managers across the organization to get an idea of each department, what kinds of skills are required, and what a potential career path within that team could be. Even if you’re not sure if sales is for you, starting out as a BDR can start you on a path to success no matter what you end up doing. Our open houses give BDRs who may have been reluctant to admit that they no longer wanted to pursue sales new options available to them. 3. Work with successful leaders who began as BDRs at Salsify. We don’t just talk a big game here at Salsify. We have several cases of people who started as BDRs, and are now occupying high level positions within the company. One of these people is Kathleen Mello, who joined the Salsify team two years ago as a BDR. Kathleen Mello (left) shares her journey through the BDR position at Salsify. Her first job after school, Kathleen admits she didn’t have a strong idea of what kind of career she wanted to pursue when she started working here. Over the course of her time as a BDR, Kathleen spoke to members of the product and customer success team to realize how her interests and skills aligned with the team’s needs. “Eventually the stars aligned, and a spot opened up on our newly-formed support team!” she said. Interested in becoming a BDR for Salsify? Apply here today to launch your sales career!